KUALA LUMPUR: Malaysia's residential property transactions will fall marginally this year as buyers move away from the high-end segment to focus on houses priced RM500,000 and below. 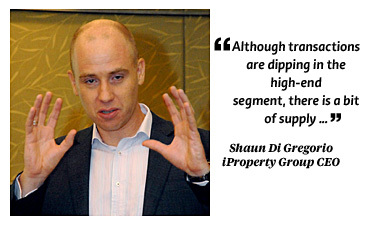 "Although transactions are dipping in the high-end segment, there is a bit of supply there which is why we think the fall will be marginal," Shaun Di Gregorio, chief executive officer of iProperty Group, said. Based on the data released by the National Property Information Centre, the residential segment accounted for RM61.83 billion of the total RM137.83 billion worth of properties sold last year. The top-end market comprising bungalows, semi-detached homes and serviced apartments in hot spots had a bull run for a long period. But there is concern now on rising house prices across the board and their affordability. In the past 12 months, developers had been shifting their focus to build houses priced between RM300,000 and RM500,000 because of demand in this price range, Di Gregorio said. "We understand they are going to be building more landed properties priced between RM150,000 and RM500,000 on the outskirts of Kuala Lumpur for the next two to three years. It is a business decision driven by analysis, data and demand," he said. Di Gregorio said companies which have ongoing mixed development projects like SP Setia Bhd and Mah Sing Group Bhd will be spreading their launches according to market demand and sentiment. "They will not flood the market at one go, but focus on building properties based on demand," he added. According to iProperty Group's recent online property survey, 73 per cent of the 11,966 respondents preferred landed properties as there is better price appreciation. The survey showed that price and location were the two key factors that the respondents viewed as important ahead of political/economic climate, when deciding to purchase a property. Some 31 per cent of the respondents were looking to buy properties in the next six to 12 months and around 19 per cent said they would buy in the UK, Australia and Singapore. Around 52 per cent of those surveyed considered the current economic and political climate to be conducive for property investment. "The figure reflects a slight reduction from the previous survey as the market is anticipating the upcoming general election," Di Gregorio said. PETALING JAYA: Crest Builder Holdings Bhd is looking to “monetise government assets” as its property development strategy. “We hope to secure one or two more in the next 12 to 18 months,” executive director Eric Yong said at a press conference after the company’s EGM yesterday. He added that since the company believed in a quick turnaround time, it was still looking for “pocket land” in matured areas to privatise. “In this case, this would mean existing buildings to be privatised or redeveloped,” he said. The company is targeting to secure between RM200mil and RM400mil in contracts by year-end. The jobs are mainly for building jobs in the Klang Valley, although it has submitted bids for infrastructure projects as well. Crest Builder’s current orderbook size in terms of its property development segment stands at a gross development value (GDV) of RM2.5bil, which includes its Dang Wangi project and Malaysian Rubber Board (MRB) project. Syarikat Prasarana Negara Bhd had partnered with Crest Builder to redevelop the Dang Wangi light rapid transit (LRT) station. The project will see Crest Builder and its 49% joint-venture (JV) partner Detik Utuh Sdn Bhd developing a single-block mixed development atop the station. The development has a GDV of RM1.04bil and will front Jalan Ampang. The company said it would submit the development order to the authorities next month. If all went as planned, it said the full approvals would be received in April or May next year. “We plan to start the physical work in the second quarter of 2013. Based on the agreement with Prasarana, the project is scheduled to be complete in 2018,” Yong said. Meanwhile, in regards to the MRB project, Crest Builder had earlier received a letter of intent from MRB for a mixed property development in Ampang via its 51% subsidiary Landasan Bayu Sdn Bhd. Landasan Bayu is a JV between Crest Builder and Tindakan Juara Sdn Bhd. The project has a GDV of RM1.33bil. Yong said the MRB project was on a similar timeline to the Dang Wangi project. “We plan to start works in the third quarter of 2013 and finish in the later half of 2018,” he said. He expects the two projects to start contributing to the company’s financials in 2014. “As with each year, we target double-digit percentage growth in profit and revenue. Last year, we grew by about 15%. So, we hope to maintain or increase the growth,” he said. Crest Builder’s construction order book stands at RM1bil, with RM1.3bil in unbilled sales inclusive of the two projects. “If we don’t account for the two projects, our order book can last till the end of next year. If we include it, the order book would last until 2017,” Yong said. Moving forward, Yong said he expects the property development segment to contribute more towards the company’s revenue and profit. “Ideally, it would be a 60:40 revenue share between construction and property. We expect to reach those levels by 2013. The catalyst for the growth in its property development segment would be the Dang Wangi project and the MRB project. Yong also said the company expected to launch Phase 2, 4 and 5 of the Batu Tiga project in Shah Alam. The project comprises medium to high-end cost developments, with a total GDV of RM445mil. “This park is certainly one of the best and biggest among all the Legoland parks. They have some interesting features and I have been going around to visit some of the rides to see for myself,” he said, adding that so far he was pleased with everything.